Effectively treating groundwater on construction sites is a statutory requirement as well as an environmental responsibility. 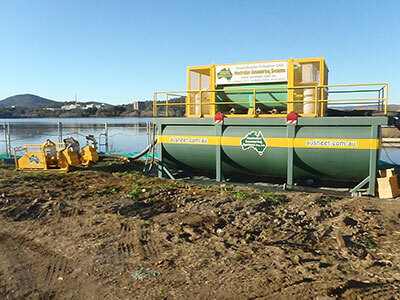 Australian Dewatering Systems helps you exceed requirements and have peace of mind. Local, state and federal authorities are demanding that any groundwater removed from the water table meets, at the very least, minimum water quality criteria according to the EPA guidelines prior to discharge. ADS exceeds the minimum standards and gives clients security in knowing the job is completed correctly the first time. The increasing legislative and media focus on the discharging of site groundwater has created a legal requirement to treat the groundwater. No longer can a company ignore their environmental responsibilities. ADS has the solution for filtering and monitoring water discharge for all site locations, both onsite and remotely. Suitable to all ground conditions, including acid sulphate, organic and clay, the Groundwater Treatment System is a fully computerised system that is used to manage coagulation, flocculation and PH adjustment. ADS may produce graphical data quality assurance for submission to the client and regulatory authorities on demand. Full Compliance: ADS exceeds standards set by state and local authorities in addition to those established by the ANZECC Water Quality Guidelines for the Protection of Aquatic Ecosystems. Leading Technology: The system is compact and economically priced. ADS prides itself on continually developing its water treatment system and holds Australian and International patents on its current technology. Convenience: ADS prepares the site dewatering plan in conjunction with a client’s DMP and their appointed environmental consultants. Newly patented technology that meets and exceeds industry requirements for treatment and discharge of water to our waterways. Over 26 years of industry experience in all facets of dewatering. A remote alarm via SMS and email to our service technicians 24 hours a day. Water monitoring, sampling and testing. Call Australian Dewatering Systems on 1300 949 607 or contact us now for more information on groundwater treatment services and how we can help your construction project in New South Wales, Qld and ACT, plus other locations throughout Australia. 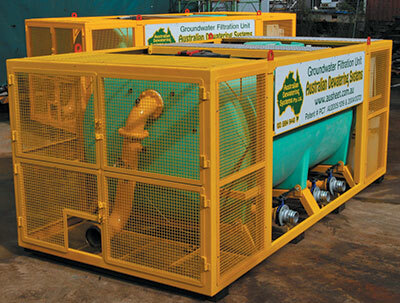 One of Australian Dewatering Systems’ fleet of computerised groundwater filtration units for effective groundwater treatment on construction sites. A typical groundwater treatment set-up featuring pumps, treatment unit and filtration tank.